The kids went to their parkour lessons again today. Their workout today was more intense than their previous sessions. In the past, they would finish in about an hour and a half. But today, they went more than two hours. That’s two hours of running, jumping, falling, moving all over the place. I figured they would be very hungry afterwards, but I did not bring anything to eat for snack. Fortunately, the gym was near a marketplace. I walked around and saw a stall selling “turon” and “banana-cue”. These are native snacks that are commonly sold in market stalls. 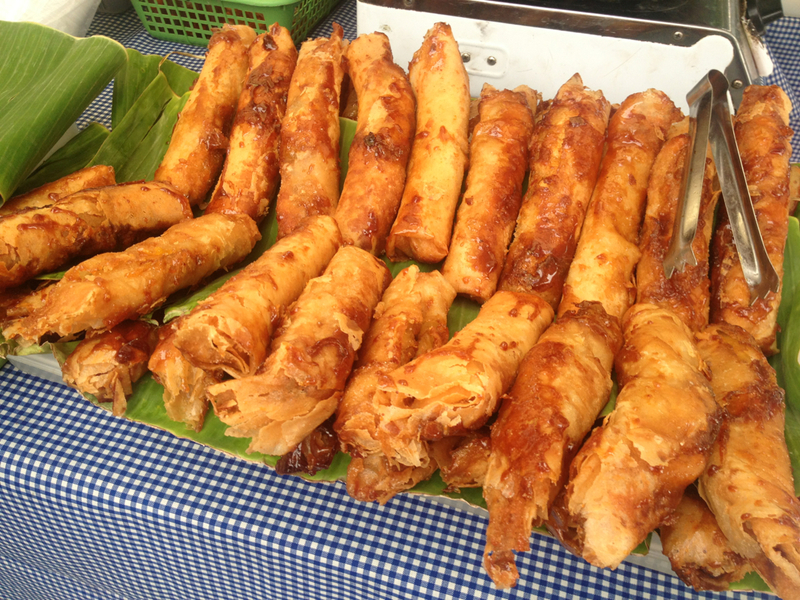 “Turon” is made up of sliced sweet plantain bananas wrapped in spring roll wrapper and fried with sugar. “Banana-cue” is made up of whole sweet plantain bananas cooked with brown sugar and skewered on a barbecue stick. They are very affordable, delicious and available just about everywhere. I got some “turon” and a few sticks of “banana-cue” for our afternoon snack. The kids wolfed them down to the last bite. Really delicious! This entry was posted in Food, Grateful Project, Life in the Metro and tagged Food. Bookmark the permalink.